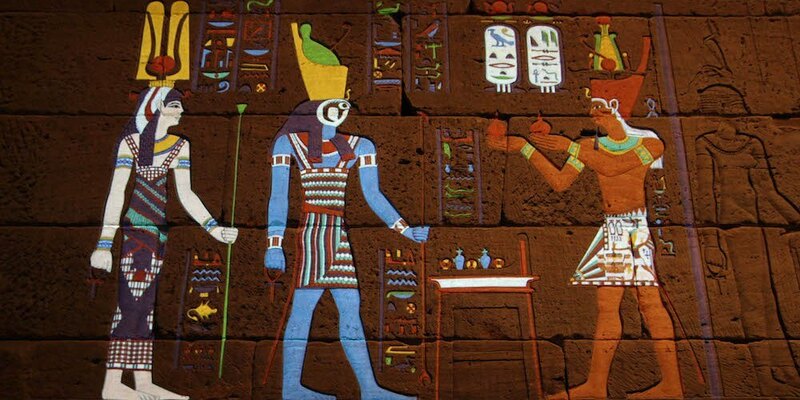 Archaeologists at New York’s Metropolitan Museum of Art have digitally restored artwork from an ancient Egyptian temple, showing the time of the pharaohs in an incredibly detailed and colorful light. Due to 2,000 years of flooding and the harsh desert sandstorms, many of the original signs that ancient Egyptian architecture was once vibrant and brightly colored have been wiped away. However, by studying first hand accounts of Egyptian explorers – such as early diagrams by Britain’s Aylward M. Blackman – and even the ancient civilisation’s fashion sense, experts have reimagined the mesmerizing colors which would have adorned the Temple of Dendur. The 10 BC temple once sat on the banks of the River Nile, before a UNESCO salvage project rescued it from yearly flood damage in the 1960s. It was later given to the United States in 1965 by the Egyptian government and then donated to the Met museum two years later by US president Lyndon B. Johnson. In an initiative aptly named ‘Color The Temple’, the Met MediaLab team have now used mapping technology and projected beams of light to brighten a scene of hieroglyphics that until recently had been nullified by beige Aeolian sandstone. The markings depict Roman emperor Caesar Augustus, in full pharaoh dress, presenting wine to the god of the sky, Horus, and love goddess Hathor. As ruler of Egypt at the time, Augustus would have wanted his subjects to think of him as their pharaoh. After consulting 19th and 20th century surveys of the building, the team of creatives at New York’s Met settled on a series of likely color patterns to overlay the symbols with pinpoint accuracy. The result is about as trippy as watching a blue god take booze off a Roman emperor can get, with kaleidoscopic colors enhancing the previously faded symbols. “Using relatively recent advances in software, we were able to experiment with restoration using nondestructive means (projected light rather than a material like paint) to temporarily display content with presenting any challenges for conservation,” a Met Museum blog post explains. The Emerald Tablets – What Are The Halls of Amenti?